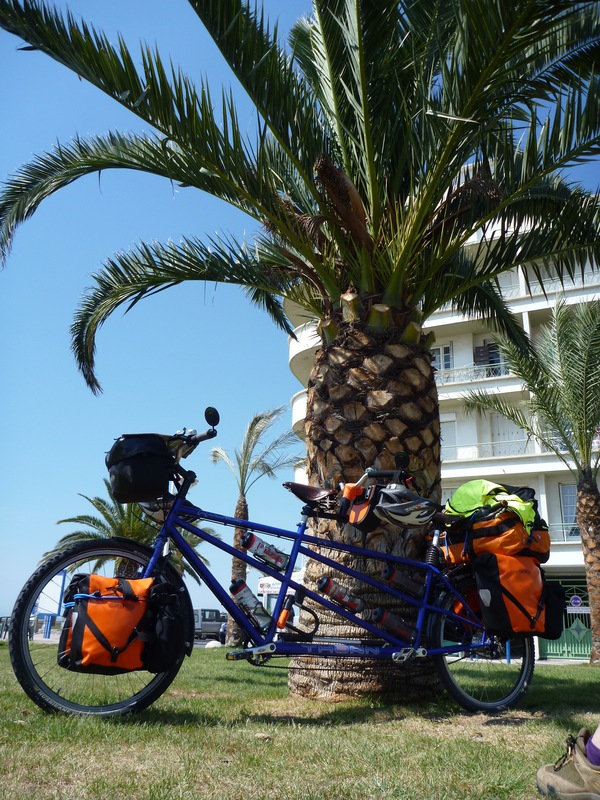 The slow pace enforced upon you when you are cycle touring is one of it’s greatest pleasures. There is nothing like it, you have the complete luxury of being able soak up all of your surroundings in a way which you just can’t do with ay other form of travel, except perhaps long distance walking (more on this later). Once you are fit, which will happen if you stay in the saddle long enough, then the miles can seem to roll pass with barely any effort, and when effort is required to get up the next big mountain pass then you are rewarded with stunning breath taking scenery, and of course the magic of freewheeling down the other side. We are choosing this form of travel for our family so we can teach our girls from a young age that a healthy, simple lifestyle can often be the most rewarding. There are a a number of reasons why we choose to cycle on a tandem. Firstly it’s just plain good fun, there is nothing quite like the amazement/confusion of peoples faces when they see a fully loaded tandem slogging up a hill! Being on a tandem also gives us the luxury of being able to communicate easily all day, which can be vital when making you way through busy streets. One of our favourite aspects of tandem riding is that we always set off together in the morining, and arrive together at the end of the day, we never get split up at traffic lights, and no one is left waiting on the hills ect. 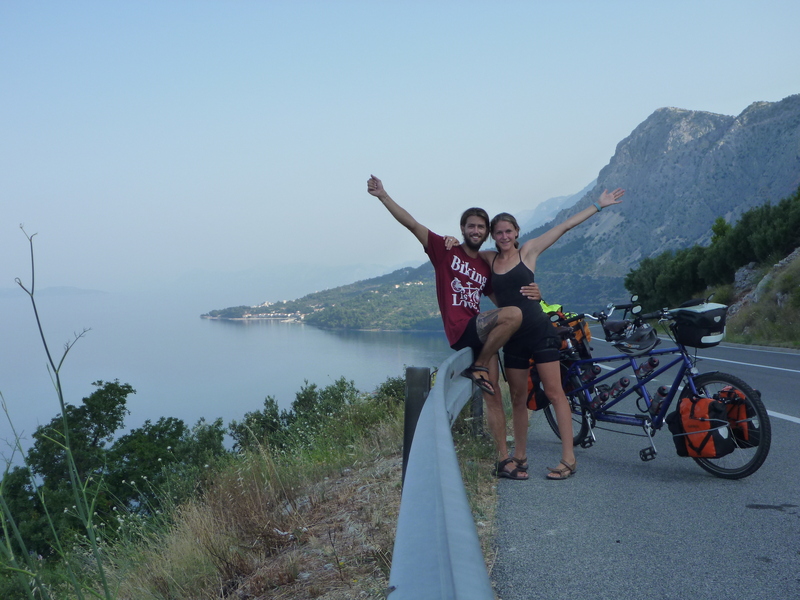 There is also the benefit of being able to help each other, on our last tour we both had days where we had no energy and if we were on 2 separate bikes we probably would have to stop for the day, but on a tandem one person could push the two of us along. In a bright yellow Tipi…..no really. We will be camping for the vast majority of our tour. This time will be a little different from our last tour of Europe as we are more likely to be camping at designated sites each night (instead of cycling until we dropped and pitched our tent in the bushes hoping no one would spot us in the middle of the night). We are also going to be spending some time in cheap guest houses & B&B’s, this is most likely to happen when there is long periods of bad weather, or when we had stopped somewhere for a few days. 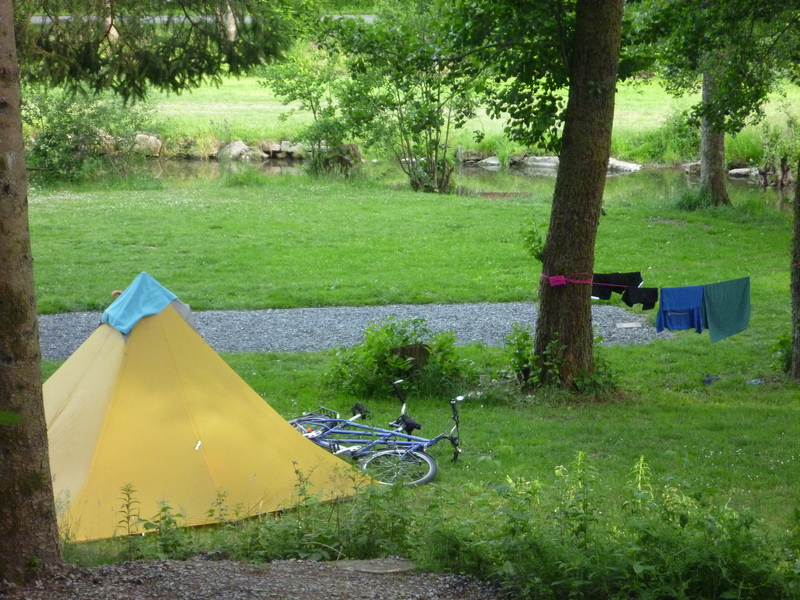 There are 2 main reasons for camping, firstly it is cheap which means we can travel for longer. And secondly we just love the simplicity and tranquility of camping, there really is nothing like it, and it’s made all the more enjoyable when you get to sleep in a bright yellow Tipi every night! People are often confused buy how we could possibly afford to take 6 months off work and travel. The answer is very simple. Work bloody hard and save even harder. We live a very simple life, we don’t even own a TV, which affords us the luxury to save a little money each week. Also whist on tour we will be living an even simpler life, with the majority of our time camping and cooking all meals for ourself, this in turn leads to a relatively cheap way of life. 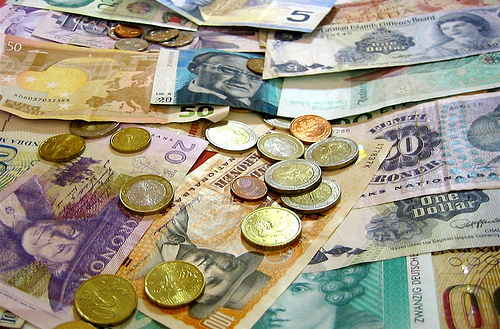 For example our last 4 month tour of Europe we only spent around $5000 AUD, less than $40 a day! Most people would spend this on a 2 week holiday to go lay on a beach somewhere hot?! If there is anything you would like to know then just leave us a comment and we’ll try our best to answer your questions! I just buy a PEDAL POWER tandem, the same of yours. It was fitted with a standard 3×9 speed derailleur but i transform it with a rolhoff speedhub. I just need some picture of the 2 rohloff cable way on the frame.